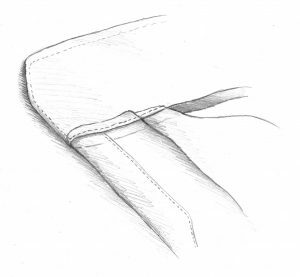 In the firm belief that a quality shirt comes from perfection in every detail, each collar and cuff is finished to the customer’s exact requirements (soft or stiff, using the exclusive “turnover” technique). The pieces are then attached to the body of the shirt using the traditional set-in method. We can meet almost any request: lined fronts for lighter fabrics, elaborate initials and emblems all rigorously embroidered by hand. All stitching is performed using special ultra-fine-needles that allow up to 10 stitches every centimetre, with obvious benefits for the finished look of the shirt.